This really is my favorite time of year. Nearly every surface of our kitchen is bursting with amazing produce, thanks to Groundswell! I’m so grateful we are able to have such abundance at our finger tips. I’ve been working away in the kitchen, creating many different dishes to use what we have before we get more! This week includes my all-time favorite broccoli salad, a roasted peach salad, roasted eggplant and pepper relish, shrimp and bok choy stir fry and a simple creamy cucumber salad. 2 heads broccoli, each 3/4 – 1 lb. Trim broccoli and chop into large chunks, then cut each floret chunk into thin slices. Cut the stems into thin matchsticks. Toss sliced broccoli with almonds and cranberries. In a small bowl, whisk buttermilk, mayonnaise, vinegar, sugar and salt until smooth. Stir in onion. Pour dressing over broccoli mixture and add black pepper. Stir again, so salad is evenly coated. Serve immediately, or keep in fridge for 2 – 3 days. 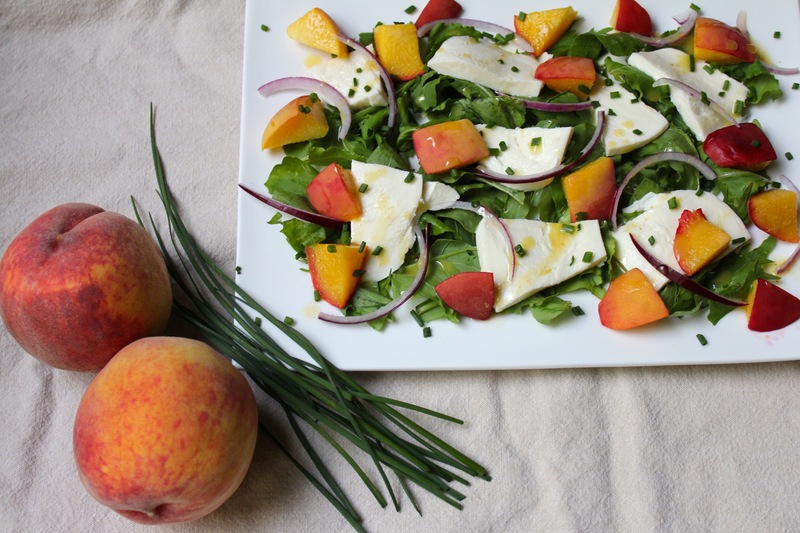 Preheat oven to 300 F. Slice your peaches, mozzarella and red onion, and chop your chives. Line a baking sheet with parchment paper and place your peaches on it so they are not touching. Roast for about 8 minutes, or until warm and juicy. In a bowl or on a platter, toss your clean, dry salad greens and arrange the rest of the ingredients on top. Drizzle dressing on top of the salad. It won’t need much to highlight the flavors. When finished roasting, tumble the hot vegetables into the vinaigrette, tossing well to combine. Make sure to scrape any caramelized bits off of the pan and any accumulated juices. Allow the vegetables to marinate for 20 minutes at the least, serving the relish warm. My preference is to cool the mixture, then refrigerate in a sealed container overnight. It can then be served at room temperature or warmed gently. You could use to make a great toasted sandwich – perhaps add some cheese, too! While the shrimp marinates, separate the baby bok choy into leaves and, if desired, trim and de-string the snow peas. Set aside. Bring a pot of water to a boil over medium-high heat. Add 1 tablespoon oil and reduce the heat to low so that the water is at a bare simmer. Add shrimp and cook, stirring constantly, for 1 minute. Drain the shrimp thoroughly, and set aside. Place a large skillet or wok (not nonstick) over the highest heat the pan can handle. Heat until the pan is very hot: A drop of water flicked on the surface should sizzle and evaporate within a second or two. Swirl 1 tablespoon of oil into the hot pan, then add ginger, garlic, chili-garlic sauce, and the white parts of the scallions, and stir-fry for about 10 seconds. Add the snow peas and bok choy and stir-fry for 2 to 3 minutes, or until the bok choy leaves are wilted. Add wine or vinegar and soy sauce and stir-fry for 1 minute more, or until the bok choy stems are starting to get tender. Add shrimp and stir-fry for another minute, or until the shrimp is cooked through, the veggies are tender, and everything is coated with sauce. Remove from the heat, and mix in the cashews and the green parts of the scallions. 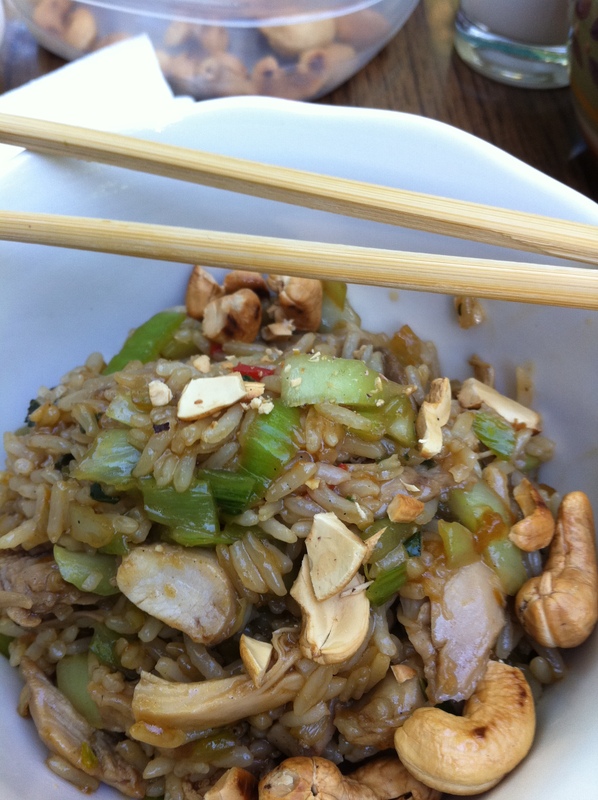 Spoon over rice, garnish with sesame seeds, and serve immediately. Happy first week of Groundswell CSA! My name is Penelope and I’m blogging recipes for you this season! Our family has been members for the last few years, and I’m excited to share recipes and inspiration for using your share each week. I love finding great recipes to use our share, as well as creating my own. I could happily spend all day playing in the kitchen. Here’s to a great season of beautiful, local produce from our great Groundswell farmers! Whisk together all ingredients until emulsified. Alternatively, you could whirl in the blender for a few seconds. For the salad, wash and dry your greens. Cut the pears in half, core them and cut into matchsticks or thin slices. Lightly coat the pears with a little dressing to prevent discoloration. 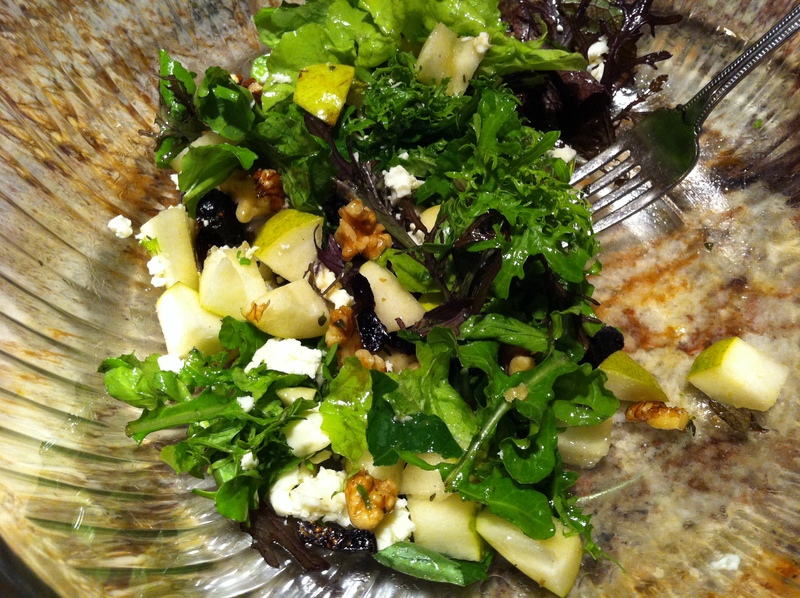 In a large salad bowl, toss together the greens and pears. Sprinkle with freshly grated parmesan and pecans. Top with dressing as desired. Store unused vinaigrette in refrigerator for up to two weeks. First things first – get your brown rice cooking if you don’t already have some ready to go! Then, before you begin to stir-fry, make sure all of your vegetables are chopped and your eggs are beaten. For the green garlic, I chopped the white-purple part, the lighter green and about half of the darker green. In a large wok over medium-high heat, warm half of the oil (1 1/2 TBSP) with half the red curry paste (1/2 TBSP), half the salt (1/2 tsp.) and a pinch of the chopped green garlic (you’ll cook the rest later). Mash it all together, then pour the eggs in and cook. Keep tilting the pan so the egg spreads, and scrape towards the center as it cooks. Once the eggs are cooked, cut into bite-sized pieces and put in a bowl. Wipe out your wok and heat the remaining oil, red curry paste and salt. Add the bok choy and the rest of your green garlic and stir-fry for 2 minutes. Add the spinach and scallions and stir-fry until the spinach is just wilted. Add the corn and stir-fry for another minute. Add your 2 cups of brown rice and tamari, stirring until everything is hot. Lastly, add the eggs and give it one final stir. Serve immediately. Fill a large pot with water bring to a boil. Snap woody ends off of asparagus and discard. Keep heads in tact and slice stems. Blanch asparagus for 2 minutes, until bright green and crisp-tender. Remove asparagus with tongs and put in a bowl, reserving the asparagus water. Rinse asparagus under cold water to stop cooking. Trim root ends off of green garlic and leeks. Slice green garlic crosswise into thin rounds and place in a large bowl. Slice the leeks in half lengthwise, then slice white and light green parts into half moons. Place in bowl with green garlic, fill with cool water and separate rings to release any dirt. Rinse green garlic and leeks clean. Melt butter and olive oil together in soup pot or dutch oven over medium heat. Add leeks and green garlic and saute for 5 – 7 minutes, until bright green and tender. Add the salt, potato and about 4 cups of asparagus water to cover veggies. Bring to a boil, then cover and simmer until potato is very tender, about 10 minutes. Add asparagus, reserving several heads for garnish, then puree the soup with an immersion blender or in batches in a regular blender. You can add more asparagus water to thin, if needed. Stir in the juice of half a lemon, and add more salt if needed. Stir together yogurt and lemon zest. Serve soup in bowls with a dollop of lemony yogurt and a couple of asparagus tips. Will keep in fridge for up to three days. This easy recipe is made with parsley and chives, but you could definitely use other herbs! In a food processor or high-powered blender, blitz the parsley, chives, olive oil, lemon zest and pinch of salt and pepper until mostly smooth. Use to top grain dishes, eggs, pasta, toast with avocado and tomatoes and more! Cook rice according to package directions and preheat oven to 375 F. Meanwhile, caramelized the onions by heating butter and olive oil in a large, heavy skillet over medium -low heat. Add onions, sprinkle with salt and pepper and cook until they’re tender and sweet, stirring occasionally. This should take about 30 minutes. Add the kale ribbons and cook until the wilt a bit, about 5 minutes. Stir onion-kale mixture, cooked wild rice and 1 cup of grated baby swiss in a large bowl. Add salt and pepper if needed. Assemble the gratin by coating a 2-quart baking dish with 1 TBSP butter. 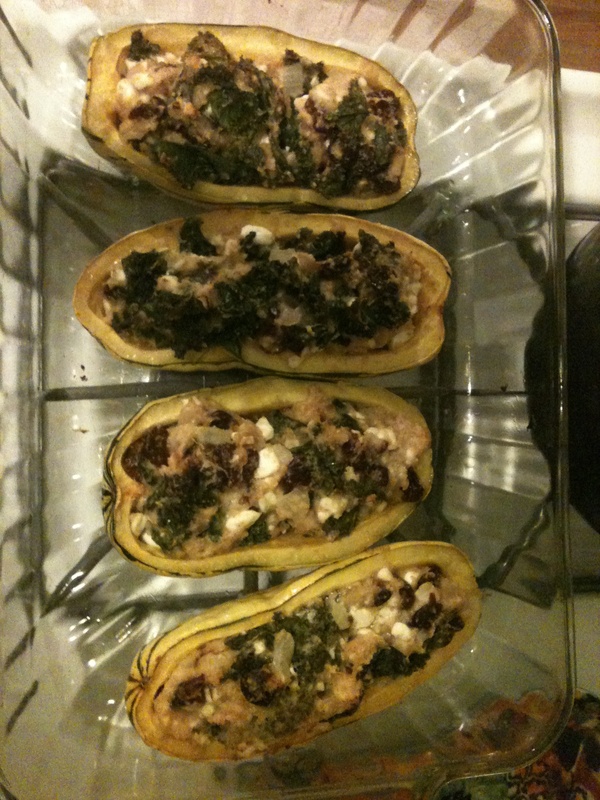 Pour your bowl of wild rice, onions, kale and swiss into baking dish. Pour broth over it, then cover with remaining cheese. Toss breadcrumbs with 1 TBSP of melted butter and salt and pepper to taste. Sprinkle on top of the cheese. Bake for 30 – 35 minutes, or until a little bubbly and beginning to brown on top. I look forward to bringing you more ideas next week for your greens. Let me know how these recipes turn out for you when you try them! http://www.groundswellfarm.org/wp-content/uploads/2018/02/Groundswell-Farms-Logo-v6-1030x321.png 0 0 Steve Whittington http://www.groundswellfarm.org/wp-content/uploads/2018/02/Groundswell-Farms-Logo-v6-1030x321.png Steve Whittington2015-06-06 21:27:552015-06-06 21:27:55Week One: Spring Greens! Hello members, welcome to week 20! The ides of October are more auspicious than the ides of March. We have a tutorial on making your own pumpkin puree. We found six good recipes, all in pairs, and we couldn’t “pare” them down, so here are the pairs: a pair of pumpkin recipes, a pair of delicata squash recipes, and a pair of root vegetable mashes (parsnips and celeriac). Pairs all around! Wash pumpkin, snap off the stem. Use a sharp knife to cut pumpkin in half horizontally. Scrape out guts with a large metal serving spoon. Separate the seeds from the guts to make a batch of roasted pumpkin seeds. Discard the guts (compost if you can). Cut pumpkin halves into 1-2 inch cubes. In a large pot, place 1 inch of water on the stove over medium heat. Lightly salt and add pumpkin cubes. Bring to a simmer and reduce to medium low. Put the lid slightly ajar and allow pumpkin to steam for about 15 minutes or until tender. Remove pot from heat, drain using a colander, let pumpkin cool. Remove the rind from each pumpkin cube using a fork. Discard the rind. Puree the pumpkin meat in a food processor until smooth. Return the puree to the same pot and simmer on medium low until liquid has cooked off, stirring occasionally to prevent burning. May be frozen if not using immediately. Combine pumpkin puree, cider vinegar, maple syrup, mustard, garlic, salt and pepper in a medium bowl or a glass jar. Whisk well to combine. Add olive oil slowly in a thin stream, whisking continually. Add fresh thyme and stir well. Stored in a sealed container in the refrigerator for up to 5 days. In a medium bowl, stir butter, sugar, and honey together. Whisk in the egg. Whisk in the baking soda, buttermilk, and pumpkin puree. Add salt, cornmeal and flour. Do not overmix. Add batter to a greased 8 inch baking dish. Bake for 25 minutes or until top is golden brown. Serve with additional honey and butter if desired. Adjust oven rack to middle position and preheat 375 degrees. Rub squash with 1 Tbsp oil and lightly season with salt and pepper. Then lay on a baking dish. If squash halved do not sit flat, use a vegetable peeler to peel a strip or two away from the bottom so that squash lays flat. Bake until flesh is tender, about 25 minutes. Meanwhile, prepare the stuffing. Heat remaining olive oil in a large skillet over medium high heat until shimmering. Add apples and leeks, stirring occasionally until lightly browned, about 10 minutes. Stir in the garlic, raisins, and thyme, cook another 1-2 minutes. Reduce heat to medium, add kale, cover the pan and cook, stirring occasionally, 5-7 minutes until kale is mostly wilted. Transfer mixture to a large bowl and let cool slightly. Season to taste with salt and pepper. Add cottage cheese, eggs, bread crumbs and parmesan. Mix well. Remove squash from oven, divide filling equally among four halves. Sprinkle squash with additional bread crumbs and parmesan, and dot each squash half with 2 cubes of butter. Any leftover stuffing can be baked in a grease baking dish alongside. Bake until squash is tender, and stuffing is lightly browned. *Delicata squash skin is thin and tender when cooked, so no need to peel it. Combine curry powder, salt and pepper in a small bowl. Blot tofu dry with paper towel, cut into 1 inch cubes. Toss tofu in a medium bowl with 1 tsp of the spice mixture. Heat 2 tsp of oil in a large skillet over medium high heat. Add tofu and cook, stirring every 2 minutes until browned, 6-8 minutes total. Transfer to a plate. Heat remaining 2 tsp of oil over medium high heat. Add squash, onion, ginger, and remaining spice mixture. Cook until vegetables are lightly browned, 4-5 minutes. Add coconut milk and brown sugar, bring to a boil. Add half the kale or chard and cook until slightly wilted, about 1 minute. Stir in the rest of the greens and cook another minute. Return tofu to the pan, cover and cook, stirring once or twice, until squash and greens are tender, 3-5 minutes. Remove from heat and stir in lime juice. Recommended: serve with quinoa or brown rice. Peel and chop the parsnip like you would a carrot. Boil the parsnips until tender, then drain. Add in the other ingredients and mash, using an immersion blender, hand masher, processor, or your favorite method of pulverization. Serve with butter or olive oil. Place celeriac and parsnips in a large sauce pan and cover with lightly salted water. Place potato in a medium sauce pan and cover with lightly salted water. Bring both sauce pans to a boil over medium high heat. Reduce heat to low, cover, and simmer gently, about 20 minutes for the potato and 30-40 for the celeriac and parsnips. When potato is tender, drain and transfer to a large bowl. Mash with a masher and covered with foil. When the celeriac and parsnips are tender, drain and transfer to a food processor, blend until smooth. Add the puree to the mashed potato. Meanwhile, combine broth and oil in a sauce pan. Heat on the stove until steaming. 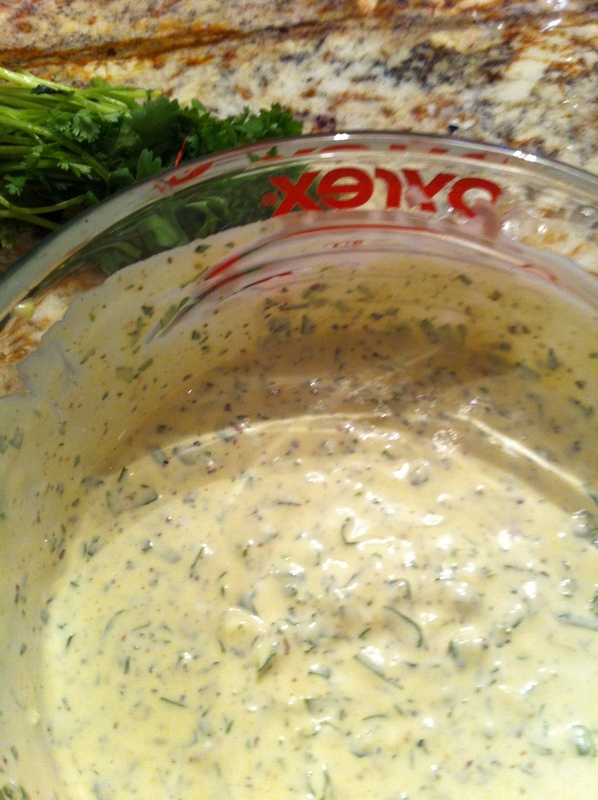 Stir in the puree along with 2 Tbsp chives, yogurt, mustard, salt and pepper. Stir in parmesan, garnish with remaining 1 Tbsp of chives. Autumn You Glad We Have More Soup Recipes? Hello Members, welcome to week 16! We have some more soup recipes for you, including a black bean soup that doesn’t call for stock (you sort of make stock as you make the soup). 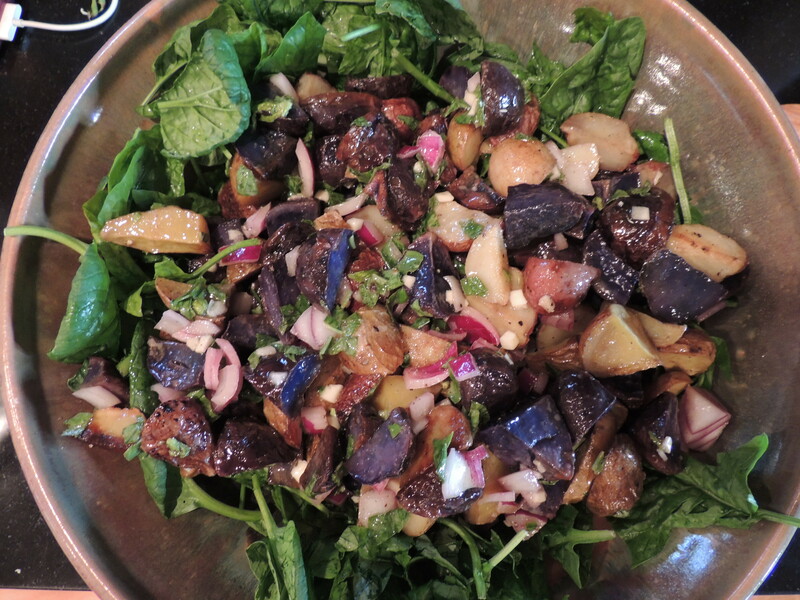 There is also a roasted root vegetable salad, so if those delicious bunches of beets and carrots are starting to pile up in your fridge, it will be a good outlet to use them up. We were also feeling a little decadent, so two of the recipes call for cream and cream cheese. Enjoy! In a large pot over medium high heat cook the beans in water that is 3x higher than their volume. Let boil 10 minutes, then cover and remove from heat, and let stand one hour. Drain and rinse. Stir in carrot, celery, onion, garlic, bell peppers, japenos, lentils, and tomatoes. Add all the seasonings. Cook on low for 2-3 hours. Stir the rice into the cooker during the last 20 minutes. Puree about 1/2 the soup in a blender or food processor, add back to the pot and serve. If you don’t have parsnips and turnips on hand, substitute them with more potatoes, beets, carrots, etc. Place all root vegetables in a large bowl, drizzle with olive oil and toss together. Season with salt and pepper. Divide mixture between two sheet pans and spread evenly. Roast vegetables for 30-40 minutes, gently tossing with wooden spoon. Transfer vegetables to large mixing bowl, and gently toss with balsamic vinaigrette. Top with pine nuts and feta and serve! Bring carrots and broth to a boil in sauce pan on high heat, cover. Simmer on medium low heat 30 minutes, or until carrots are very tender and most of the broth is absorbed. Uncover for the last 5 minutes. Remove from heat, mash until smooth, add cream cheese, stir until melted. Optional: top with chopped chives, parsley, herb of your choice. Saute onion in the tablespoon of butter, set aside. Cook 1/4 cup melted butter and flour in a stock pot over medium high heat, stirring with a whisk, for 3-5 minutes. Stir constantly, then add half and half. Add chicken stock, simmer for 20 minutes. Add broccoli, carrots, and onions. Cook over low heat, 20-25 minutes. Add salt and pepper, optional: puree in a blender or use an immersion blender. Add cheese and nutmeg over low heat, remove from heat and enjoy. Remove husks from tomatillos, chop into quarters. Remove seeds from jalapenos, dice. Dice the onions and garlic. In a large pot heat oil over medium high heat and saute onions for 3 minutes. Add garlic, jalapenos, tomatillos, cumin, coriander, and pinch or 2 of salt. Saute 5 minutes. Add liquid and beans, bring to a boil and cover. Reduce heat and simmer, 1 hour for soaked beans and 30 minutes for canned beans. Serve with cilantro, avocado, limes, and tortillas. http://www.groundswellfarm.org/wp-content/uploads/2018/02/Groundswell-Farms-Logo-v6-1030x321.png 0 0 Steve Whittington http://www.groundswellfarm.org/wp-content/uploads/2018/02/Groundswell-Farms-Logo-v6-1030x321.png Steve Whittington2014-09-14 21:15:232014-09-14 21:15:23Autumn You Glad We Have More Soup Recipes? Do you like some fruits with your veggies? Or a little sweet to go with savory? Check out these recipes! Wash and scrub the beets and carrots. Place them in a large enameled iron pot and coat them with the 2 Tbsp olive oil. Roast at 375 for 30-45 minutes, until tender. When cool, you may remove the beet skins by rubbing with your hands. Rinse the lentils and check for small pebbles. Put them in a saucepan, cover them with water and bring to a boil. Simmer uncovered on medium for 30-40 minutes. You may need to add additional water as they cook. Drain the lentils and place in a large shallow serving bowl. In a blender or food processor, puree the garlic, lemon juice and salt to make the aioli. Add the olive oil and puree until thick. Pour this over the lentils. Add the carrot tops, herbs, lemon zest and salt and pepper. Toss. Place the carrots and beets on top of the lentils, and sprinkle the feta on top. These are a healthy, kid-friendly treat that’s fun to make and eat. This works best if you have a juicer at home, but a blender will work with some fruits and leafy greens. For specifics, it really depends on what fruits and veggies you would like to use. Here are some parings we suggest. Berries with Beets (The berries will also work in the blender, especially if you like having chunks of real fruit in your popsicles. Again, I’d start with the berries (raspberries, blueberries, etc.) and go with one beet at a time, tasting as you go. Prepare the juice to your liking. If you don’t have popsicle molds, just pour the juice into small paper dixie cups and add a popsicle stick. Stick them in the freezer for a few hours. When they’re frozen solid, just peel off the paper cup and enjoy. Drain and rise beans if using cans. Add all of the ingredients to a large bowl. Make the dressing in a small bowl or jar and whisk or shake. Pour on top and mix well. We just got our first plums of the season from the farmer’s market! Place the beets in a steamer basket or colander inside a saucepan with 2 inches of water. Cover and steam for about 20 minutes, until tender. Let cool, remove skins, and cut into small slices. 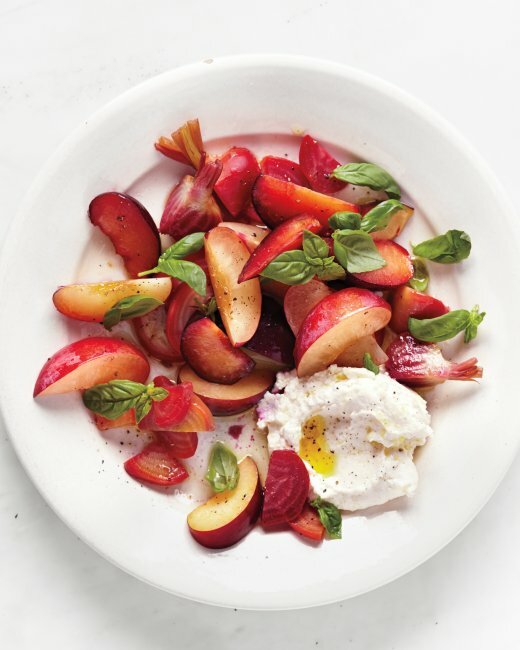 Place the beets, plums and ricotta on a plate/platter. Drizzle with vinegar and oil, salt and pepper and top with basil leaves. Hoping to make pickles, but not up for the challenge of fermenting or boiling jars all afternoon? These refrigerator pickles are perfect for you. We modified the recipe so it only takes 4 cucumbers. Feel free to double (or triple) it if you’ve got extras. Slice cucumbers very thin into medallions. Add to a lidded jar or tupperware container, and pour in the liquid. The liquid won’t look like enough, but the salt will draw the moisture out of the cucumbers and it will be the perfect balance. Close the lid and give a good shake now and every few hours. The pickles will be ready in 6-8 hours, and last up to 3 weeks in the fridge with this method. Despite absolutely glorious weather for the last 2 weeks, today definitely feels like winter may be right around the corner. This weather makes me want nice thick, homemade soup for lunch/dinner and to store some in the freezer so that when I don’t have as many wonderful fresh vegetables available to me, I can pull out a homemade batch of soup. Both of the following soups can be prepared and then frozen for a later meal. 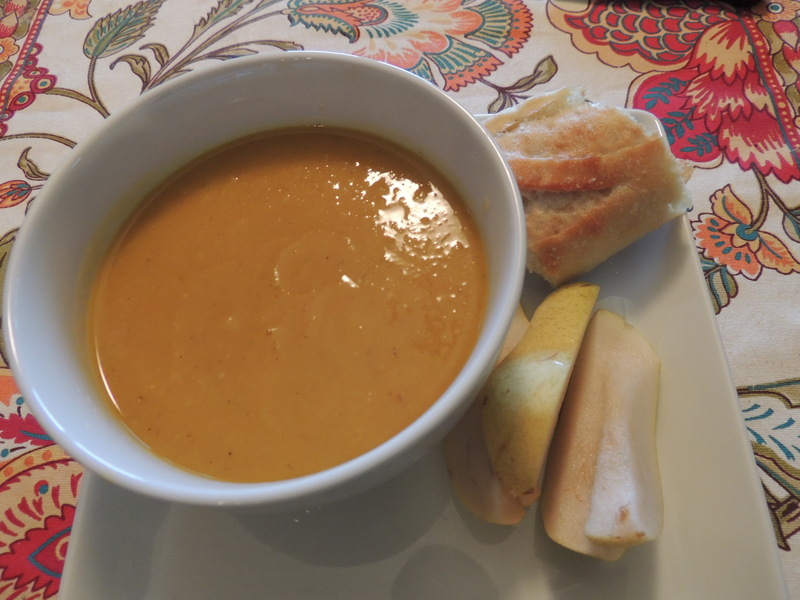 For the pumpkin soup, you could substitute butternut squash, buttercup squash or calabaza for the pumpkin if necessary. To prepare the pumpkin or which ever squash is being used, preheat oven to 350 degrees. Cut the pumpkin into quarters. Put on baking sheet and roast for about 45 minutes or until tender. Let cool and then peel. Now you can chop it up for the recipe. Cook carrots, celery, onion and pears in butter in a large pot for 10 minutes. Add the broth, nutmeg, cinnamon, syrup, salt and pepper and pumpkin. Simmer for 30 minutes. Cool slightly. Puree with a stick blender or in a blender (if you use a blender and it is still hot, remember to take out the insert in the top and hold a clean dish towel over the opening to allow steam to escape). Return to pan. (If you are going to freeze the soup, this is the time. When you are ready to serve it, heat the soup up and continue the recipe.) Pour 1/2 cup of cream into soup. Beat the rest in a bowl. Stir the cardamom into the whipped cream. To serve, ladle soup into bowls. Dollop with whipped cream. Rinse the split peas in a strainer and then combine them with the stock and water in a large soup pot. Bring to a boil. Add the ham bone, celery, 1 Tablespoon of the parsley and the tarragon. Reduce the heat to medium-low and simmer, partially covered, stirring occasionally for 45 minutes. Melt the butter in a saucepan over medium-low heat. Add the carrots, onion and leek. Cook until the vegetables are wilted, 10 minutes. Add them to the soup pot, along with the spinach. Simmer, partially covered, 30 minutes. Remove the soup from the heat. Remove the ham bone and shred the meat from the bone, removing any excess fat. Return the meat to the soup. Add the sherry, pepper and remaining 2 Tablespoons parsley. Heat through and serve immediately. Another favorite cold weather dish around here is pot pies. Actually I could probably serve this at any point in the year and it would be a hit but I enjoy it more in fall or winter. 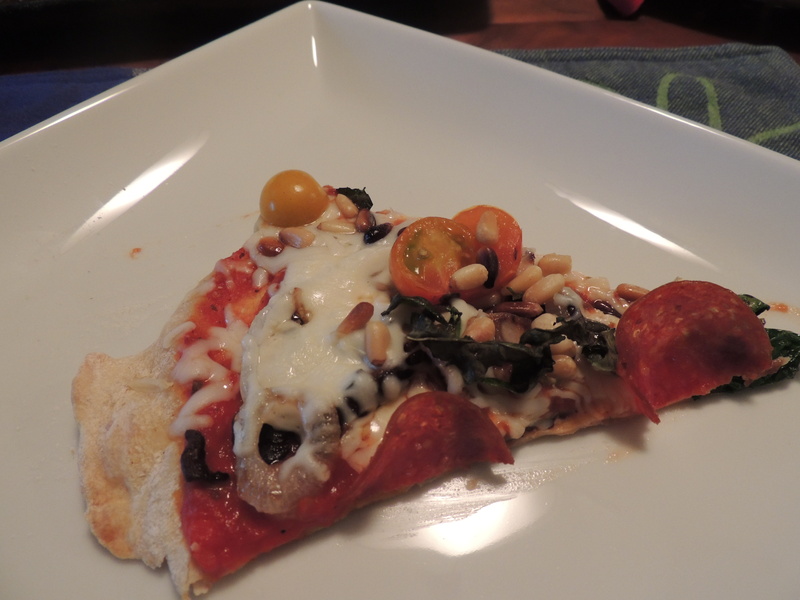 This recipe is adapted from Moosewood Restaurant New Classic Cookbook. When I was growing up I know I always preferred pot pies that had crust around the whole pie and not just on the top so, rather than do the biscuit topping the original recipe calls for, I use a pie crust and line 4 small oven safe baking dishes. I then pour in the contents and wrap the pie around over the top. I can safely say that it isn’t a work of art but it is gobbled up around here and that is all that I am looking for. You can use any number of different vegetables in the pot pie depending on what you have. I almost always throw in carrots and sometimes green beans. My kids will eat things in a pot pie that they might not eat plain (i.e. sweet potatoes). Last night when I made it, I didn’t have mushrooms so just beefed up the other amounts of vegetables and it worked out just fine. Preheat the oven to 400 degrees. Line four small baking dishes with pie crust. I think you could make as many as six because I always have a fair amount of leftover filling that I use in the following days. Warm the oil in a soup pot. Add the onions and garlic, cover and cook on medium heat for 10-12 minutes, stirring occasionally. Add the salt, thyme, mushrooms and mustard. Cook until the mushrooms start to release their juices, about 5 minutes. Add the sweet potatoes, white potatoes, parsnips, black pepper and the water or stock and bring to a boil. Then reduce the heat, cover and simmer for 15-20 minutes, until the vegetables are just tender. Stir the dissolved cornstarch mixture into the simmering vegetables, stirring constantly. When the liquid starts to thicken, mix in the peas, corn, soy sauce and salt(if using). Pour the vegetables into the prepared baking dishes. Wrap the pie crust over the top. Bake for about 20 minutes or until they start to bubble and the crust is golden. Sometimes (and some weeks more often than sometimes) I just don’t have my act together and am trying to throw something together at the last minute. This summer I embraced the frittata for dinner when that happened. I don’t know that there is any one recipe I used so the following recipe is just an example. A frittata is a good vehicle for extra greens, potatoes, onions, herbs, peppers, zucchini and probably many other vegetables. I’d cut the following frittata into wedges and serve it with salad or some fresh fruit. Both of my kids like most things when cooked into a frittata. Heat olive oil in a 12″ oven-safe skillet over medium heat. Add potatoes and onions and saute until tender. Add spinach and cook until just wilted. Whisk the eggs, milk, chives and salt and pepper to taste. Lower the heat to medium low and add the egg mixture to the skillet. Stir quickly to get everything mixed together. Cook until the bottom is just set and sides are starting to pull away, about 5 minutes. The top will not be completely cooked yet. Place the skillet under the broiler and cook for about 3-5 minutes or until the frittata is puffed and set. Serve immediately with cherry tomatoes sprinkled over the top. This recipe isn’t very cold weather oriented but maybe we’ll have a few more nice warm days and some fish on the grill will sound good to you. The original recipe called for packaged slaw. I always thought I didn’t like coleslaw but then when I made it myself once, I realized how delicious it could be. I’m sure you can cut it thin enough for slaw but I have a bargain mandolin so use that and it works wonderfully. 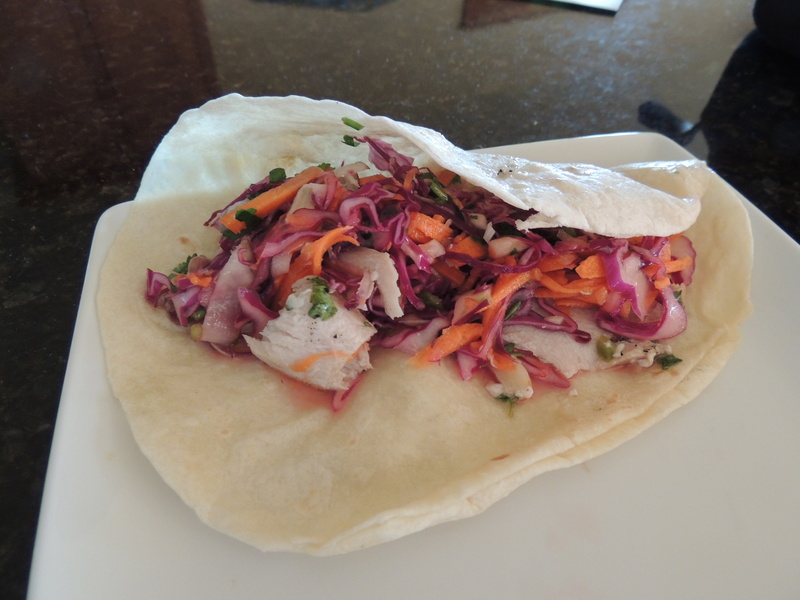 We usually put our fish and slaw in tortillas. My son will eat a mountain of these. Rinse fish. Pat dry. Place fish in shallow dish. For dressing, in a small bowl combine lime juice, cilantro, oil, honey, jalepeno, garlic and salt. Divide mixture in half. Stir lime peel into one portion of dressing. Pour dressing with lime peel over fish to marinade. Marinade about 30 minutes at room temperature. For slaw, combine cabbages, carrots, jicama and/or kohlrabi. Pour remaining dressing over slaw and toss to coat. Chill until time to serve. Preheat grill. Grill fish directly over medium coals until fish flakes easily (about 4-6 minutes per half inch of fish). Serve fish with slaw. Just like I enjoy the season changes, I also enjoy the produce changes. A tomato or peach in the middle of winter from the grocery store bears absolutely no resemblance to what we have been enjoying for the last month. When we received brussels sprouts last week I was quite excited to eat one of our standard fall dishes. When you read the next two recipes, you will realize that they aren’t the healthiest brussels sprouts recipes ever but the brussels sprouts are so delicious and we eat them so infrequently that I just don’t care. Both of my kids will eat brussels sprouts prepared this way versus roasted or steamed. To me the secret is cooking them slightly longer than you think you should cook them so that they are heading past golden brown but not all the way to burned. They are then carmelized perfection. Heat 2 Tablespoons oil in a large skillet over medium high heat. Working in 2 batches and adding more oil between batches. cook brussels sprouts cut side down in a single layer in a skillet until golden brown, about 5 to 6 minutes. Season brussels sprouts with salt and pepper. Toss and cook until tender about 4 minutes longer. Transfer to a large bowl. Repeat with remaining brussels sprouts. Remove skillet from heat. Add syrup, butter and herbs to pan. When the butter has melted, return brussels sprouts to pan and toss to coat. Lay slices of bacon in a cold skillet and cook over medium. When done set the bacon aside for another use. What you need is the bacon grease. In that hot bacon grease, cook the brussels sprouts cut side down for about 4 to 5 minutes or until just past golden brown. Season the brussels sprouts with seas salt. Toss and cook until tender, about 5 minutes more. Just before serving drizzle with balsamic vinegar. Don’t do this too early as it will gum up in the pan. This was a find from several years ago when I received spaghetti squash in the weekly CSA distribution. I tried the just cook it and and serve it with spaghetti sauce method and that was not much of a hit in our house. So I had to find something else. My husband and I will gobble this down. If I omit the meat, my daughter will eat it, maybe not gobble but alas we have to start somewhere. Cut squash in half. Remove the seeds. Put on half cut side down in a microwaveable baking dish with about 1/4 cup of water in the bottom of dish. Cover and microwave for about 10 minutes or until tenderon high. Repeat with other half. Cool. Meanwhile, saute sausage, bell pepper, onion and garlic in heavy large skillet over medium high heat until sausage browns and veggies are tender, breaking up sausage with back of spoon, about 12 minutes. Mix in marinara. Using fork, pull out squash strands from shells leaving shells intact. Mix squash into sausage mix. Season with salt and pepper. Spoon into shells. Can be made one day ahead. Cover and refrigerate. Preheat oven to 400 degrees. Arrange squash halves on baking sheet. Sprinkle each with 1/4 cup Parmesan. Bake uncovered until heated through, about 20 minutes. I’m not sure where I found this recipe years ago but I love it because it is delicious, it uses almost any veggies that you have and it gets gobbled up around here by everyone. When I have parsnips, corn or green beans, they can easily be thrown in and other vegetables can be omitted. This recipe is quite forgiving. I often freeze some of it to enjoy later for dinner or in a kid’s lunch. Melt butter in large pot over medium heat. Add vegetables. Saute 10 minutes. Add both stocks and bring to a boil. Reduce heat and simmer 20-30 minutes. Add barley, thyme and oregano. Simmer until barley is tender stirring occasionally for about 35 minutes. This soup can be made ahead of time and chilled. Just return the soup to a simmer before you continue. Add beef to soup. Simmer just until beef is cooked, about 10 minutes. Mix in parsley. Season with salt and pepper. Around my house fajitas are always met with excitement. We always put bell peppers and onions in ours but really there you could put in squash or anything sauteed or roasted with the right seasoning and it will work. This recipe calls for chicken but you can do it with any kind of protein. Whatever toppings you like. For us that is guacamole, salsa, monterey jack, refried beans, sour cream,chopped tomatoes and cilantro. Combine the lime juice, olive oil, oregano and salt and pepper in a glass bowl. Mix well and add the chicken breasts. Cover and let marinade. Prepare the grill. In a small skillet, combine the onions and pepper strips and the marinade. Simmer at low heat for about 30 minutes. Grill the chicken breasts for about 8-10 minutes turning halfway through. Slice the chicken into strips about 1/2″ wide. Wrap tortillas in a damp clean dish towel and heat tortillas in microwave for about 30 seconds until warm and more pliable. Put out platters with chicken, tortillas and vegetables and all of your toppings. This is a handy little recipe to make and throw in the freezer and save for later, just like pesto. And just like pesto, it can take so many things from sandwiches to dips to pasta from good to sublime. Enjoy! Preheat oven to 325 degrees. Cover baking sheet with foil. This is crucial or you will have a heckuva a mess later. Depending on the size of the tomato you are using, this step will be a little different. If you are using something roughly the size of a Roma, cut it in half and lay it on the cookie sheet cut side up. If the tomatoes are bigger cut them into slices that are about 3/4 – 1″ thick. Lay them on the cookie sheet. Don’t overlap tomatoes but you can get a lot on the pan. Drizzle generously with olive oil. Season with salt and pepper. Put in the oven and let the magic begin. Nothing happens for about 45 minutes and then they will slowly start to collapse. The last time I did this last week, I cooked them for about 3 hours. You want them to start to carmelize but not burn and that is a fine line once they really start to cook. Once they are done and have cooled. I pop them in a freezer safe container and save them for the winter when they will spice up just about anything. Every Friday for the last 6 or so years in our house is Pizza Night. Mitchell and Katie look forward to this all week partly because kids love routine and what kid doesn’t love pizza? The first couple of years were fairly traditional pizzas for my husband and I but I started to tire of pizzas laden with cheese and pepperoni. About this time, we joined Groundswell. Pizza is a good way to use quite a few different vegetables. So, now I saute whatever veggies we get that I think we might enjoy on the pizza (spinach, onions, veggies, sweet peppers, etc) and then throw on some fresh garlic, sliced tomatoes and basil. Maybe pepperoni if we feel like it or mushrooms if I have them around. You can buy a premade crust or a crust mix but we make our own. This recipe makes 6 medium pizzas for us so I freeze any extra and defrost it the following Friday. Here is the crust recipe for our pizza that a friend gave me years ago. Put sugar and yeast in a small bowl. Stir in 3 fluid ounces lukewarm water. Leave in draft free space to activate. If it doesn’t bubble and foam in 5 minutes, throw away and start again. Mix flour and salt. Add olive oil, rest of water and yeast mixture. Mix until it loosely clumps together. Transfer to a lightly floured surface and knead 8 minutes, adding flour or water if necessary until you have a soft dough that isn’t either too dry or too sticky. Grease a bowl and roll ball of dough around bowl to coat. Leave dough in bowl with a clean dish towel to cover the bowl in a draft free location for 1.5 to 2 hours to double in size (or 8 hours in the refrigerator to rise slowly). Punch down dough. Divide into 6 portions. You can freeze any unneeded dough at this point. Working with one small portion, roll out to desired size. I use a rolling pin because we enjoy thin crust pizza. Place crust on a well oiled cookie sheet. Bake at 475 degrees for about 5-6 minutes. Remove from oven, Flip crust. Top with desired toppings. Cook another 5-6 minutes or until cheese melts. When I was growing up, I didn’t like stuffed peppers. That was because my mom stuffed green peppers with ground beef, stewed tomatoes and rice. Not a tasty combination if you ask me. Thankfully one day about 15 years ago I found this recipe in Bon Appetit and realized how tasty stuffed peppers could be. My daughter loved this until she became a vegetarian so it is definitely kid friendly. Bake peppers uncovered until tops are browned and thermometer inserted into filling registers 165 degrees, about 1 hour. Transfer peppers to platter. 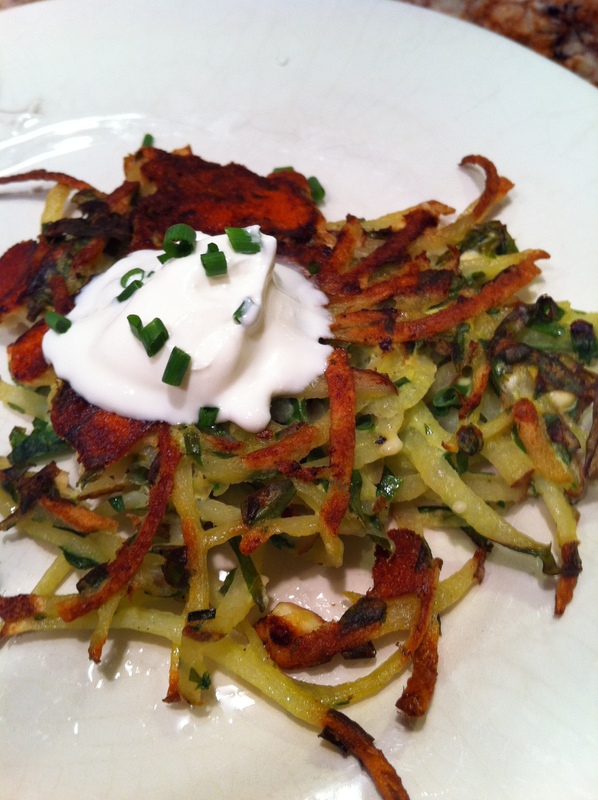 Last week I shared one of our favorite potato recipes. Here is another one that is quite simple and yet quite tasty. Preheat the oven to 400 degrees. In a medium roasting pan, toss the potatoes with the olive oil and season with salt and pepper. Roast for about 40 minutes, tossing occassionally, until tender and browned. Let the potatoes cool completely. 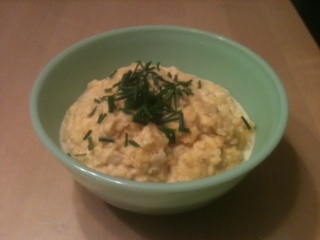 In a small bowl, combine the mayonnaise, mustard, dill and garlic. Toss with the potatoes and season with salt and pepper. Tomatoes, tomatoes, tomatoes. How we, my husband and I, love fresh picked, sun-ripened tomatoes. Yum! 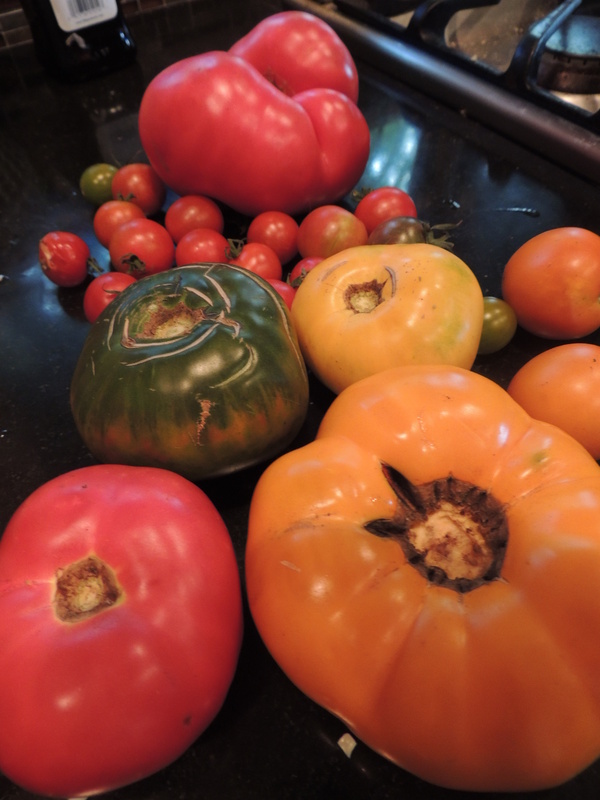 As I’ve said before, I didn’t used to have an appreciation for heirloom tomatoes but now every summer I can’t wait to start getting the delicious heirloom tomatoes from Groundswell. I want to eat them at every meal and love snacking on the cherry tomatoes. Unfortunately, my kids are just like I was as a kid and though they like tomato sauce, pizza sauce and ketchup, they don’t like raw tomatoes at all! Alas, more for me to eat. 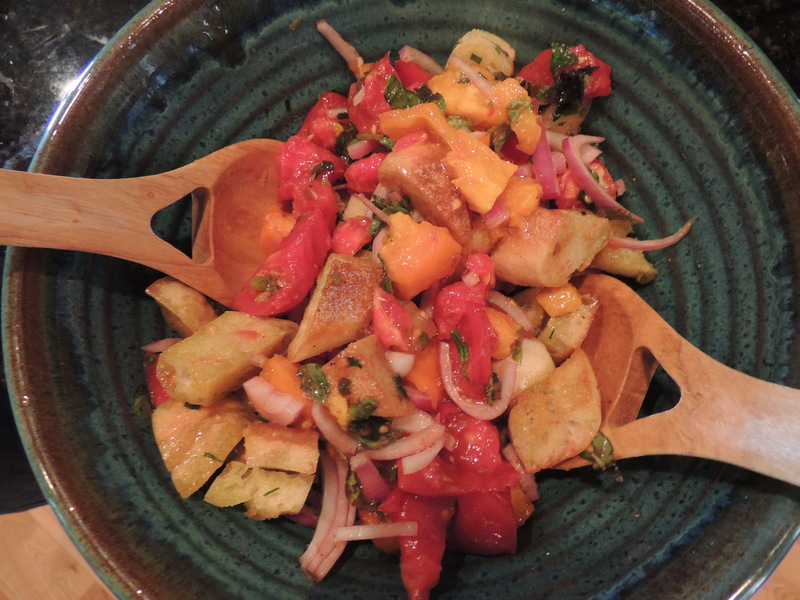 Last week, I shared an heirloom tomato salad. 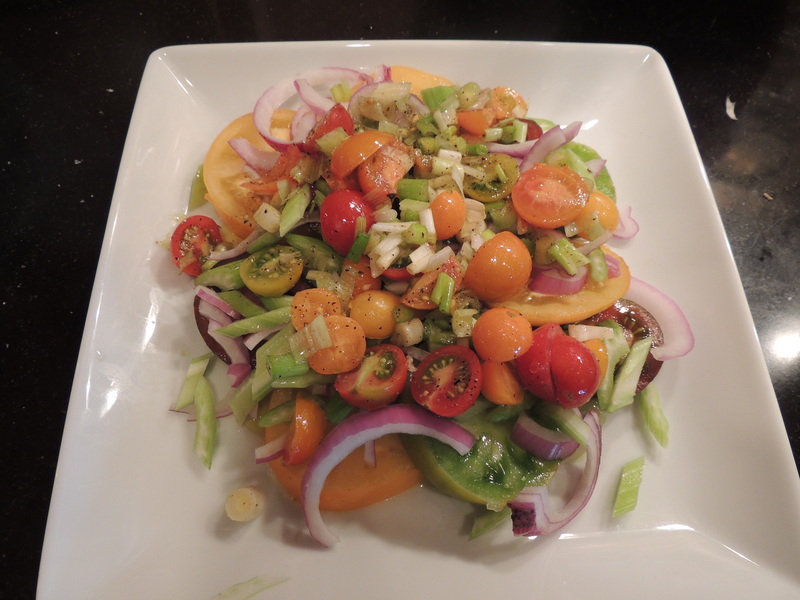 This week is another favorite– Tomato Bread Salad. This is a great use to any fresh tomatoes you have and any bread, fresh or stale. Heat the oil in a large skillet. Add the bread cubes and cook over medium-high heat, tossing them constantly with a wood spoon, for 3 to 4 minutes. Reduce the heat to medium-low. Add the garlic and herbs. Continue to cook the croutons, tossing frequently until golden brown, about 20 minutes. Cool to room temperature. The croutons can be stored in an airtight container until you are ready to use them. 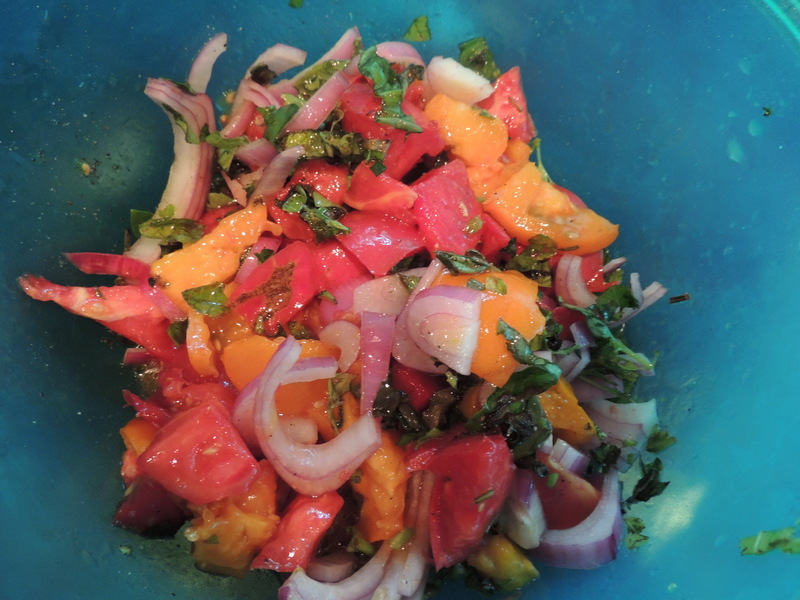 To assemble the salad, combine the tomatoes, red onions, basil, olive oil, vinegar, salt and pepper in a large bowl. Just before serving, toss in the croutons. Don’t toss ahead of time or the croutons will get soggy. For those of you who aren’t into the big chunks of tomato in a salad, another way we enjoy our tomatoes is gazpacho. A fair amount of ingredients but a fairly easy prep and you have a lovely cool summer soup. This recipe makes a lot so halving it makes sense since the raw eggs make it something you would want to eat sooner rather than later. In a mixing bowl, whisk together the vinegar, olive oil, reserved fresh tomato juice, canned tomato juice and eggs. Puree the vegetable in small batches in a blender or food processor, adding the tomato juice mixture gradually to keep the blades from clogging. Do not puree completely; the gazpacho should retain some of its crunch. Stir in the cayenne, salt and pepper and dill. Cover and chill for at least 4 hours. When you are ready to serve, stir the soup, taste and correct seasonings and ladle into chilled soup bowls or mugs. http://www.groundswellfarm.org/wp-content/uploads/2018/02/Groundswell-Farms-Logo-v6-1030x321.png 0 0 Steve Whittington http://www.groundswellfarm.org/wp-content/uploads/2018/02/Groundswell-Farms-Logo-v6-1030x321.png Steve Whittington2013-09-01 22:54:322013-09-01 22:54:32Happy Labor Day! We are getting so many absolutely delicious vegetables right now. Though it is wonderful, it can definitely be quite overwhelming at times. Salad is one of the ideas that comes to mind and there are so many options to consider. Getting my kids to eat salads can be a bit of a bear at times. Here are two salads that I have been successful with and that my husband and I love as does company when they come. My son does prefer that you warm these up a little. I think part of what he doesn’t like about “salad” is the cold factor. Alas if they will eat it, I will warm it up. 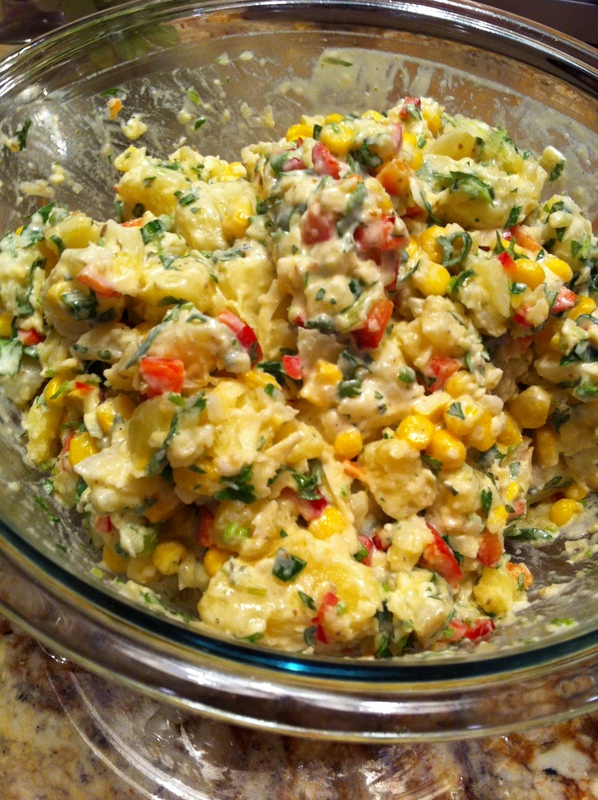 I have also learned to generally go a little lighter on the vinaigrettes and they tend to not notice that it is a “salad.” The following salad is different than the classic mayonnaise potato salad but a big hit with everyone. Arrange potatoes evenly on cookie sheet. Toss in olive oil. Bake at 475 degrees for 20-25 minutes until tender and golden. Whisk together lemon juice, garlic, basil, mustard, salt and pepper. Whisk in olive oil in slow stream. Gently toss potato and onion with 1/2 cup vinaigrette. Arrange spinach in bowls, drizzle with vinaigrette. Top with potato mixture. Sprinkle with bacon. 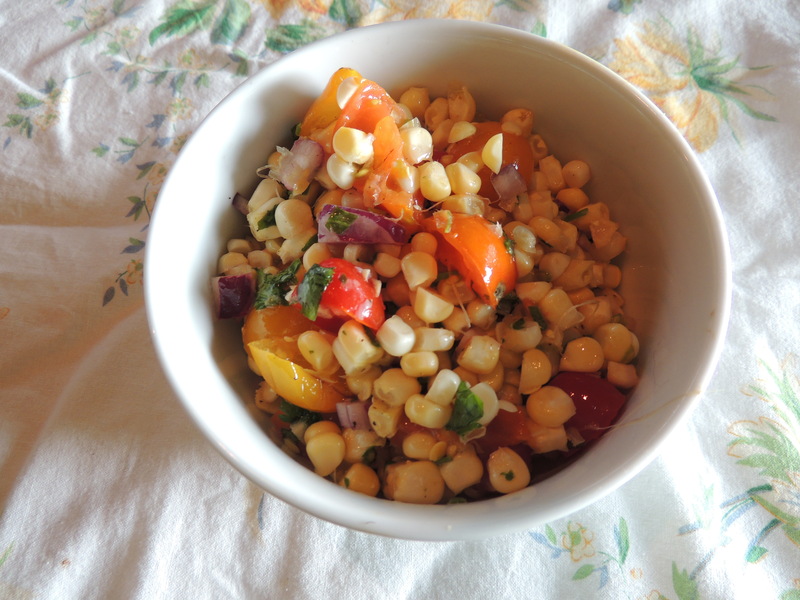 This next salad takes advantage of something in abundance right now, not through the CSA but at the Farmers Market…corn. My husband got me a book several years ago with main and side dish salads. The book has been indispensable. For the most part, the recipes call for things I normally have on hand and so far they have all been delicious. 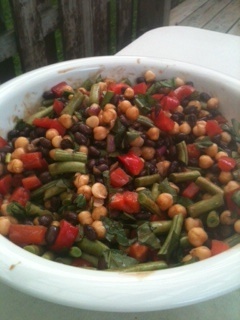 This salad is also popular with my children. Sometimes I am not out to please the family but simply to enjoy the fresh produce at hand. That would be the case for the recipe. My husband and I end up eating this for dinner probably twice a week when heirloom tomatoes are at their peak. My kids don’t understand why would would dream of eating this but I LOVE it. It is adapted from a recipe I found in Gourmet magazine years ago. When I first made it, I’d never had heirloom tomatoes and didn’t appreciate how wonderful this dish is. Now I love all of the colors and textures combining together. I believe the original recipe called for bleu cheese but I am not a fan so have changed it to what I enjoy and can find at the Holland Farmers market. Prepare grill to medium high. Rub bread with garlic and brush with 3 tablespoons olive oil. I have been known to do the previous step in a hot frying pan. Maybe not the same but quick and tasty regardless. Combine remaining 1/3 cup olive oil, currant tomatoes and green onions in medium bowl. Toss to coat. Season with salt and pepper. Overlap tomato slices in circles on platter, alternating colors. Scatter onion and celery slices over tomatoes. Sprinkle with salt and pepper. Spoon tomato and green onion mixture over top. Sprinkle with cheese. Grill bread or use frying pan, two minutes per side. Pile salad on bread and enjoy the yummy messiness! As always when I have ingredients that I don’t know what to do with, I end up trying epicurious.com. They did not let me down with this delicious cabbage soup recipe that is a hit with the entire family. The original recipe has a lemon creme fraiche topping but we do not do the topping. We just stick with the soup itself so if you think the soup would benefit from a lemon creme fraiche topping, just look it up on epicurious.com. At this point in August, I am not in the mood for a heavy thick soup but I freeze this and then can thaw it in January when I am most assuredly in the mood for this soup. 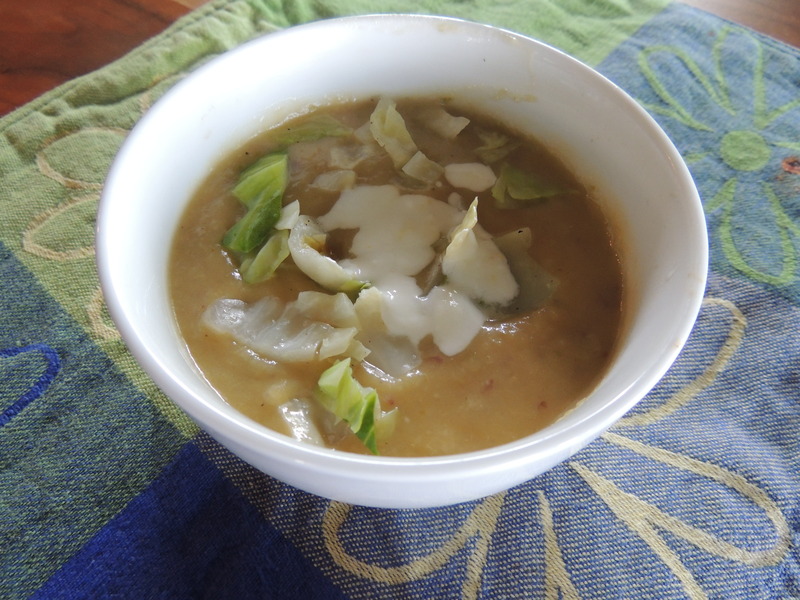 Because of this, the soup doesn’t usually have the garnish of sauteed cabbage but we enjoy it nonetheless. Pair it with some nice crusty bread and lunch is served. Melt 1 tablespoon butter with 1 tablespoon olive oil in a heavy large pot over medium-high heat. Add cabbage, sprinkle lightly with salt and freshly ground black pepper and saute until cabbage is almost tender but not brown, 6-8 minutes. Using slotted spoon transfer 1 cup cabbage to small bowl and reserve for garnish. Add 1 tablespoon butter to pot with cabbage, add leeks and garlic. Saute over medium heat until leeks soften slightly, about 3 minutes. Stir in potatoes, Parmesan rind if desired and bay leaf. Add 6 cups broth; bring to boil. Reduce heat to medium-low; cover and simmer until all vegetables are tender, 20-25 minutes. Discard Parmesan rind, if using, and bay leaf. Let soup cool. If pureeing while still warm, remember to have the center piece out of the top of the blender and hold a kitchen towel over that opening so steam can escape but not the delicious soup. Working in batches, puree soup in blender until smooth. Return puree to pot. Simmer until heated through, adding more broth by 1/4 cupfuls to thin soup to desired consistency. Season with salt and pepper. Ladle into bowls and garnish with reserved cabbage and chives. Though this is definitely a heartier meal, it fits right in with the produce we are receiving right now–zucchini, eggplant, tomatoes, peppers and onions. My kids don not appreciate this wonderful recipe but everyone else I have served it to does. Biscuits-whisk flour, cornmeal, sugar, baking powder, baking soda and salt. Using fork, cut in butter until resembles coarse crumbs. Fold in sour cream. Knead until comes together in a ball adding drop or two of milk if necessary. Cover with plastic wrap until ready to use. Ratatouille-Toss eggplant and zucchini with 5 tablespoons of olive oil. Season with 3/4 teaspoons salt and 3/4 teaspoons pepper. Spread veggies on baking sheet. Don’t crowd them. Roast, tossing occasionally until golden, about 20 minutes. Meanwhile, in a deep saute pan, heat 1 tablespoon oil. Crumble sausage and cook over medium until done, about 7 minutes. Using a slotted spoon, transfer to a paper towel lined plate. Add 1 tablespoon oil to pan. Saute onion, pepper, garlic and 1/4 teaspoon garlic until soft, 5-7 minutes. Stir in tomatoes and thyme. Simmer until tomatoes are cooked and stew-like, about 10 minutes. Stir in sausage, roasted vegetable and parsley. Pour mixture into oven safe dish. Divide dough into 6 balls. Squash into disks (1/2 inch thick). Arrange on top of ratatouille. Brush biscuits with milk. Bake in oven 25-30 minutes. One more idea for those peppers and eggplants. This is quick, easy and delicious. Preheat grill. Toss peppers and eggplant with olive oil. Grill about 8-10 minutes. Arrange on a platter. Combine 3 tablespoons olive oil, red wine vinegar and oregano. Pour over peppers and eggplant slices. Crumble goat cheese over veggies. Season with salt and pepper to taste. Welcome to the second week of the 2013 Groundswell CSA season! I am the second of three individuals blogging for the CSA this season and my bio is simple; married, working mother of a 4-year-old boy, focused on seasonal, locally sourced, organic foods, minimally processed and on the table, “right now, please, mama”!! While I have a culinary education, and can’t resist creative dishes, limited time dictates simplicity. This is our 11th year participating in a CSA and I have learned a number of tricks along the way. My goal is to share some timesaver tips with you to help turn your weekly mountain of vegetables into healthy tasty meals, in a timely fashion. I realize not every member of Groundswell is pressed for time due to family obligations and some of you may have time to linger and enjoy your evening kitchen ritual (wistful sigh); hats off to you! I will try to include a few recipes along the way that may be more to your liking, but please do not hesitate to share a recipe from your collection as well, and let us all live vicariously thru your culinary feats! Simply use the “Share Your Recipes” tab on the bar at the top of the blog. I fly by the seat of my pants in the kitchen, based on my mood and what is on hand, (as my mother would say, “Improvise!”). So, my recipes are adaptations that continue to evolve and change. Simply put, they are very flexible so please be creative and modify to your taste as well and share your experience by using the “Leave a Reply” area at the bottom page of this blog. Also, in a perfect world there would be lemons/limes growing in my back yard and a rice paddy field out front. While we strive to buy locally produced foods, we also know that in order to enjoy the locally produced foods that ARE available, sometimes we have to go out of our geographical area to get a complimenting ingredient. Last but not least, I have been known to eat a pop tart and greatly enjoy it…. great, glad we got that out in the open. This is my “go-to” salad dressing. It would make a piece of cardboard taste fantastic…seriously, it is that good. I use it on a simple bed of mixed greens and add nuts, fresh or dried fruit, blue cheese or feta and sometimes cooked wheat berries. Use whatever you have that sounds like an interesting combination of sweet, salty and tangy. The key is the balance of vinegar, honey, mustard and oil, so try to stay close to the measurements. Minced chives make a great substitute for the shallots, but feel free to omit the shallots if you are not a fan. Whisk the first three ingredients in a medium size bowl. Gradually whisk in oil. Season to taste with salt and pepper. Add shallots, if using. Store/use for up to two weeks. This dressing makes great use of the herbs oregano and cilantro. You can put this on anything from a standard mixed green salad to baked potatoes loaded with veggies. In my photo below (click on it to enlarge), I have combined cubed, steamed potatoes, lightly sautéed corn and red pepper (the last of my frozen stash from last summer!) and topped it with this dressing. Add some grated cheddar and the kids will love it! In fact, you will find yourself searching around for ANYTHING to put it on when you have a craving. The key here is the toasted cumin seeds and the fresh lime. Place the cumin seeds on a cookie sheet or jelly roll pan and place in preheated oven at 300 degrees. Toast for 7-10 minutes, checking to make sure they aren’t burning. Cool on a separate plate. When fully cooled, grind and set aside. This can be done days ahead of time. I use toasted/ground cumin in a lot of dishes so I keep a fair amount on hand. It can really pep up a fried egg sandwich, any veggie dish or hamburgers! Whisk together the lime juice, sour cream and mayonnaise. Add the oil, starting with 1/8 cup and only adding until the consistency is correct for your final use of the dressing. For example, I use more oil when I am going to use the dressing for greens than I do when I am going to mix it with potatoes. Add the garlic, oregano, cilantro, cumin seeds and mix gently. Season to taste with salt and pepper. Store/use for up to two weeks. Serves 4, but can be increased by adding more rice, veggies, tofu or chicken; you won’t need to double the sauce. As far as stir-fry sauces are concerned, this recipe is tried and true. It is perfect for this time of the year as we are enjoying bok choy, however, I make it all summer long and use it to dress any stir-fried veggies. The marmalade adds a citrusy brightness with just a hint of sweetness that goes well with any greens, broccoli, snow peas, red peppers…. and the list goes on! For added protein, you can add tofu or cubed chicken. See notes at the end about additional cooking time for adding raw chicken to the dish. The keys to a successful stir-fry are: have ALL ingredients chopped, measured and ready to go; keep your wok or skillet hot and don’t stop stirring! Carrots and red pepper, when in season, go well too! If you pre-prepped your rice, pull it out of the fridge now to let it begin to come to room temp. Otherwise, make 1-1/2 cups brown or basmati rice, following your package instructions. Whisk together marmalade, soy sauce, cornstarch and the 4Tbs of water. As noted earlier in my post, this can be made days ahead of time. Set aside. Heat wok (I prefer an iron skillet) to high heat, until water droplets evaporate within 1 second. Add oil, then garlic and ginger. Stir-fry 2 minutes. Incidentally, in case you didn’t know, stir-fry means exactly that, stir while it is frying!! Add chiles and if using tofu or cooked chicken, toss it in now. Stir-fry for about 3 minutes, or until tofu cubes are brown or chicken is heated thru. Add bok choy, and stir-fry for 2 minutes or until bok choy starts to soften. Here is where the pre-cooked rice comes in handy. Pour your desired quantity of rice over top of the veggies and then pour the sauce on top, starting with just half of your sauce and adding as needed to fully coat the rice and veggies. You may not need all of the sauce, depending on whether you added additional veggies/tofu/chicken. Save it for another dish later in the week. Stir gently to make sure all veggies/meat are coated with the sauce. Heat thru for 1-2 minutes. Serve sprinkled with toasted cashews or peanuts. NOTES: If using raw chicken, cube it and add to the pan at the same time as the garlic and ginger. You will need to increase the cooking time to 3-4 minutes, or until the chicken is no longer pink and is lightly browned. Continue with the rest of the recipe. Wash the potatoes, leave the skins on, and run them thru your food processor, using the blade specifically made for grating. You can grate by hand, but it takes mere minutes in the food processor. Place the potatoes in a colander, give a good rinse to get the extra starch removed, and then press down on the potatoes to remove access water. I then put them on a towel, wrap them up and squeeze out any remaining water. This is an important step so they crisp up when cooked. Place in a large kitchen bowl. Wash the swiss chard and remove the stems, setting them aside for use in a stir-fry. Finely chop the leaves and add to the bowl of potatoes. Also add the chopped herbs and feta cheese, stirring until evenly distributed. Beat the eggs with a fork until foamy. Add a pinch of salt and grind some pepper in, to your taste. You can add some Frank’s Hot Sauce or Sriracha chili sauce if you want to zip it up! Pour over the potato mixture and gently fold the eggs in, until everything is evenly coated with the egg mixture. Preheat your iron skillet or nonstick griddle for this one. I have read about the dangers of nonstick, however for this dish nonstick makes it super easy to cook them and clean up. Heat till water droplets sizzle and evaporate. Run a chunk of butter around the griddle to fully cover it with a coat of butter. Let that sit for about a minute before adding spoonfuls of the potato mixture, flattening each with a spatula so they cook evenly. I used a lid to one of my pots to partially cover the latkes in order to increase the heat and get them to cook faster. If done in an iron skillet they would cook faster, but the trade off is that they stick more readily. If you chose to use an iron skillet, use oil instead of butter to get a thin film of grease across the skillet. Flip when they are fully set and looking crunchy on the first side. Allow to cook till crunchy on the second side. Remove from griddle and serve immediately with a dollop of sour cream and snipped herbs. You could also serve them with some of Annie’s Organic Ketchup and the kids will gobble them down! My final recipe for the week is a bit of a wild card and one of my favorites for a number of reasons. Who doesn’t love pizza? The dough is made 24 hours in advance, which allows for it to be a no-knead dough that is completely fool-proof. The toppings are completely flexible; just use whatever you have, leftovers work best! If you double the dough, you can get 2 large pizzas, (9″ x 11″ each) which works for dinner and then leftovers for lunch the next day. The shortcuts are: 1) pre-sauté the veggies and meat (if you do a stir-fry the night before, just throw extra veggies and meat in the pan and fish them out prior to adding your sauce), 2) keep a jar of homemade pesto or BBQ sauce on hand (you can use any favorite store bought sauce) and 3) grate the block of cheese beforehand. With these items pre-prepped, it is a 15 minute assembly job the night you serve it. If you aren’t into making your own dough, any store bought version works, or throw it all on a lightly toasted English muffin, bagel or tortilla shell and run it under the broiler….pizza is served! Polenta (also know as coarse-ground cornmeal or corn grits) for sprinkling on the baking sheet; this is a KEY ingredient as it gives the pizza a wonderful rustic texture! The dough must be made 24 hours in advance to allow for fermentation, which eliminates the whole kneading process (have you ever found yourself wondering “Did I knead it enough, too long, too hard, is it going to rise?” The fermentation eliminates all the guesswork. Pour a little oil into a large mixing bowl and using a paper towel wipe it around to lightly coat the bowl. Set aside. Whisk the flour, yeast and salt together in your mixer stand bowl, then pour in the milk and oil. Using the dough hook, turn the mixer on low for a minute to get it started. Stop to scrape down the sides and then let it run on low for another minute, scraping down the sides again to get the flour incorporated. Then run the mixer for about 3-4 more minutes until the flour is fully incorporated and the dough is clinging to the dough hook. Turn off the machine, scrape the dough into the oiled bowl. Don’t worry if it is sticky; you can’t overmix, undermix or mess this up! Flip the ball of dough around a couple times in the bowl to coat it with the oil and then cover with whatever lid you have for the bowl or plastic wrap and then a clean towel on top. Allow the dough to sit undisturbed and at room temperature for 24 hours. I make this the night before serving and leave it on my kitchen counter. About 3 hours before you want to use it, turn the dough once in the bowl (gather the ball of dough, and turn it around so that the air escapes). This allows for another opportunity for the dough to rise a bit. If your schedule doesn’t allow for this step, then just turn it in the morning before you leave. When you are ready to make the pizza, preheat the oven to 450 degrees and position the rack in the center of the oven. You can divide the dough to make smaller pizzas or make one large pizza. Using a cookie sheet pan, sprinkle the polenta to lightly cover the pan. With flour-covered hands (keeps it from sticking) gather the dough into a ball and work it into a flat disc and then stretch it into a rectangular shape, about 6 x 9. Then lay it into the pan of polenta and slowly stretch it out to the full 9 x 11 size. It may try to shrink up, which is okay, just leave it be for a minute and let it relax. Then stretch it again. You can go thinner and larger than 9 x 11, but don’t go much smaller as it will be doughy and will not cook evenly. Once the dough is secured on the polenta/pan, start spreading your sauce, going as thick/thin as you prefer. Then add the meat, sautéed kale and finally the cheese. Bake for 10 minutes and check to see if the bottom of the crust is getting brown and also if the cheese is melted to your liking. Depending on your oven, (they all cook differently) you may need to bake a few minutes longer. Remove the pizza, immediately transfer to a cutting board and using a pizza cutter slice and dice it down to a bunch of squares. It is important to cut the pizza immediately, or the cheese cools and the toppings come off/apart when cutting. Enjoy! Notes: You can play around with the flour to make the crust healthier by variations of swapping wheat flour or spelt for the white flour, but my experience is that it doesn’t rise quite as much and is denser/heavier. This is not a bad thing, if the toppings are matched appropriately. 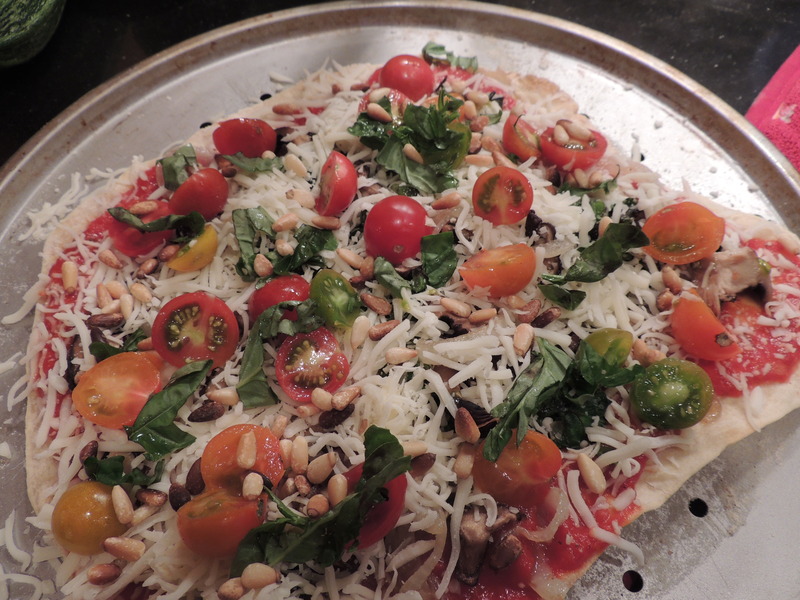 I guess I just believe that pizza is a treat and should be, well….not fat-free and the healthiest dish in your arsenal. 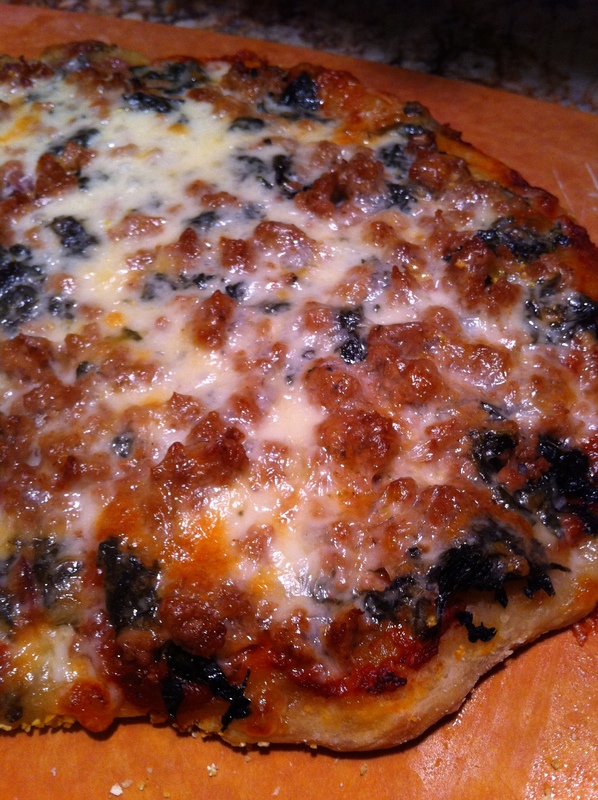 One thing to remember, if you are serving this to children; a kale pizza on a fully risen, chewy crust with lots of gooey cheese is going to be cheered, as opposed to a heavy wheat crust with minimal cheese. Just sayin….pick your battles. Thanks much for checking in to the Groundswell blog and considering these recipes for your pick-up this week. I hope some of them become your favorites as well! http://www.groundswellfarm.org/wp-content/uploads/2018/02/Groundswell-Farms-Logo-v6-1030x321.png 0 0 Steve Whittington http://www.groundswellfarm.org/wp-content/uploads/2018/02/Groundswell-Farms-Logo-v6-1030x321.png Steve Whittington2013-06-09 23:45:102013-06-09 23:45:10Spring Greens!